May - 07 | By: Bloated Cat Productions | no comments. 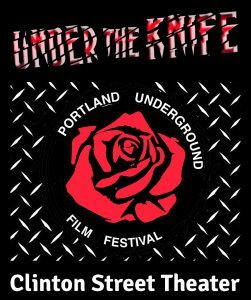 Bloated Cat Productions and Penguin Films bring local filmmaker Josh Hoffman’s latest horror feature film, UNDER THE KNIFE, to the Portland Underground Film Festival on Sunday, May 20th at 9pm. As the Closing Film for PUFF, UNDER THE KNIFE, will play in the historic Clinton Street Theater and be followed by a Q and A with the director. Fresh off of its much-talked-about World Premiere in Japan at the Yubari International Fantastic Film Festival in March, the film will have its North American Premiere at this gem of a festival here in Portland. UNDER THE KNIFE was written and directed by local filmmaker Josh Hoffman and a large portion of the post-production was done locally. This edgy English-language film was shot on location in South Korea, Japan and the US, and is the first South Korea / Sweden co-production. Renowned Korean actor, Jin-geun Kim (ACACIA, 2003 and VOICES, 2007) stars as the deranged plastic surgeon, Dr. P. Beverly travels to South Korea to get plastic surgery, but ends up unknowingly getting a computerized implant from a surgeon who maniacally turns his patients into beautiful killing machines. Follow UNDER THE KNIFE on social media for full festival coverage and much more coming soon.